Daniel Jenkins and Brandon Flynn in Kid Victory. Photo by Carol Rosegg. BOTTOM LINE: Kid Victory explores internet catfishing, child abduction, and coming to terms with homosexuality with a sometimes tender, sometimes heavy-handed musical treatment. The narrative of kidnapping a young person and holding them captive has, for some reason, provoked a lot of creative juices in recent years. The idea of it plays oddly romantically over such horrific loss, where a child who everyone must assume is murdered emerges years later a fully grown adult now in need of some serious counseling. Perhaps we respond to the American ethos of struggle and triumph in the face of adversity, and the promise that it’s not quite as awful as it seems. What is fascinating is that this story seems to work across a variety of genres—from the Oscar-winning The Room to Netflix’s The Unbreakable Kimmy Schmidt and The OA, the tone could not be more different. And with Kid Victory we are offered a version we never knew we wanted—child abduction in tap shoes! 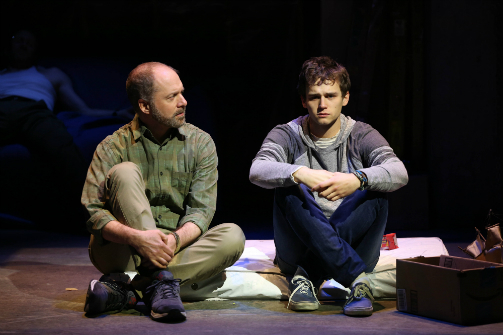 John Kander and Greg Pierce have crafted a story in small-town Kansas where Luke (Brandon Flynn) returns home after some time away, in obvious disarray. His mother Eileen (Karen Ziemba) and father Joseph (Daniel Jenkins) want everything for him, though they have the expected remove of parents who have to deal with this sort of thing. For Luke, it’s all just moving too fast: "Where I was, there was barely any noise," he says, "even more than just one voice is still kind of jarring." Luke's parents want him to get some mental health counseling but their version comes from the busybody church lady Gail (Ann Arvia). I don’t know much about small-town Kansas but they sure do love some church. We eventually learn that Luke, who went by Kid Victory on some internet game, had formed a friendship with a much-older Michael (Jeffry Denman). When sexually blooming Luke discovered they are only a few hours away, they agreed to meet up. You might be able to take it from there. The set of Kid Victory (by Clint Ramos) is grounded in the dingy basement where Luke is forcibly held by Michael. Though we’re in the present, so one half of the stage becomes a Kansas kitchen and the other half the store where Luke works, the tiny, lonely mattress, a symbol of Luke’s lost innocence by Michael’s hand, remains dead center throughout the play—an obvious reminder of the ever-present trauma that must be addressed. It's Emily (Dee Roscioli), Luke's boss and owner of a store, who nurtures Luke back to health. She’s the eccentric, cool, secular one of the bunch—her store is named Wicker Witch of the West and sells things like pink, life-sized deer—and is the olive branch that Luke most needs in his recovery. The story thinks it’s more mysterious than it is. A large part of the musical is devoted to figuring out what happened to Luke. But Director Lisel Tommy is uncharacteristically on the nose. She literally chains Luke to a wall in the opening scene; it’s not much mystery from there. Luke's confused sexuality takes him down an all-too-familiar path of earnest curiosity and abandoned hookups that don’t really tell us anything new. The musical also treats Michael, the captor, with a strange kind of empathy that feels icky. Kid Victory is worth seeing for some tender moments with Flynn and his father, played by Daniel Jenkins. There’s some palpable tension in the story of a father with a gay son in Kansas, struggling to even look at him in the wake of his horrific event. Their journey together is a satisfying albeit brief one, culminating in a memorable final song about the importance of being present. Interestingly, it’s played out sitting on that dingy mattress that's been there the whole show, forcing us to confront and make peace with the trauma of the past. "How come nobody asks us where we are? Ever?" sings Jenkins. "We can talk about trips we’ll take, boats we’ll sail on next year’s lake, but how come nobody asks us where we are?" I’m left wondering why a musical, with precision blocking, tap dancing, and all the obviousness that comes with the genre, makes sense for this story. Brandon Flynn has many a gently confident and connected moment that feels ruined by the conductor’s baton rising. Although it's possible I might have said the same thing years ago at the premieres of other Kander shows, like the one about women in prison who charmingly kill their husbands, or the musical about a sinister emcee in Weimar Germany nightclub as the Nazis come to power. Perhaps I’ll stand corrected in a decade’s time if Kid Victory joins that canon. Kid Victory has book and lyrics by Greg Pierce. Music is by John Kander. Directed by Lisel Tommy. Music Director is Jesse Kissel. Choreography is by Christopher Wilson. Scenic design is by Clint Ramos. Costume design is by Jacob A. Climer. Lighting design is by David Weiner. Sound design is by Peter Hylenski. Production Stage Manager is Diane DiVita. The cast features Ann Arvia, Joel Blum, Laura Darrell, Jeffry Denman, Brandon Flynn, Daniel Jenkins, Dee Roscioli, Karen Ziemba, and Blake Zolfo.